Every flower in our fresh flower arrangements has been handpicked from our specialized flower farms. Our aim is not to provide the cheapest flowers on the market, but in fact the most competitive prices for a high quality product. Our exquisite roses are hand picked in farms in Colombia and Equador, so you can be guaranteed that your rose floral arrangement hasthe highest quality fresh fllowers. 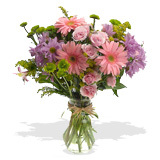 For your convenience you can chose fresh floral arrangements from a range of price points. Send floral arrangements knowing they have been designed, created and sent with the utmost care and attention.